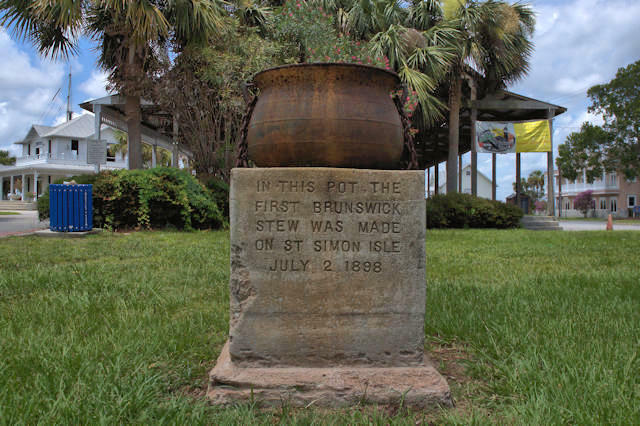 This curious monument in Mary Ross Waterfront Park claims: In this pot the first Brunswick Strew was made on St Simon Isle July 2, 1898. Both Brunswick, Georgia, and Brunswick County, Virginia, claim to be the birthplace of the delectable stew. Tyler Jones wrote a great article exploring the origin story and the rivalry for The Brunswick News. It’s highly possible it originated nowhere near either place, but somewhere in the backwoods, where pioneers made the most of everything they had on hand. We’ll doubtfully never know the whole story, but the old stew pot is a neat attraction, if dubious in origin. Brunswick, Georgia and Brunswick, Virginia have competed for the title. The stew recipes are different. Brunswick, Georgia has a stewbilee yearly and St. Simons hosts a contest each year in Redfern Village. See the Brunswick/Glynn Chamber of Commerce for dates of the annual festivals. that pot has moved around a lot over the years….it was at Chamber of Commerce building at entrance to causeway back in the 40’s and 50’s(? )..then on Court House grounds….now it’s moved again….my Mom used to make Brunswick Stew to feed big crowds at 4-H and Extension events back then…..as a young teenager I wasn’t very excited about helping with that!